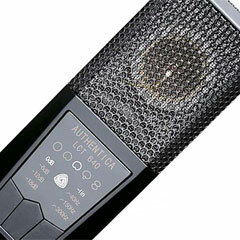 Lewitt Audio is a new microphone company from Austria. I received the company’s two flagship condensers, the LCT640 and LCT540 for review. 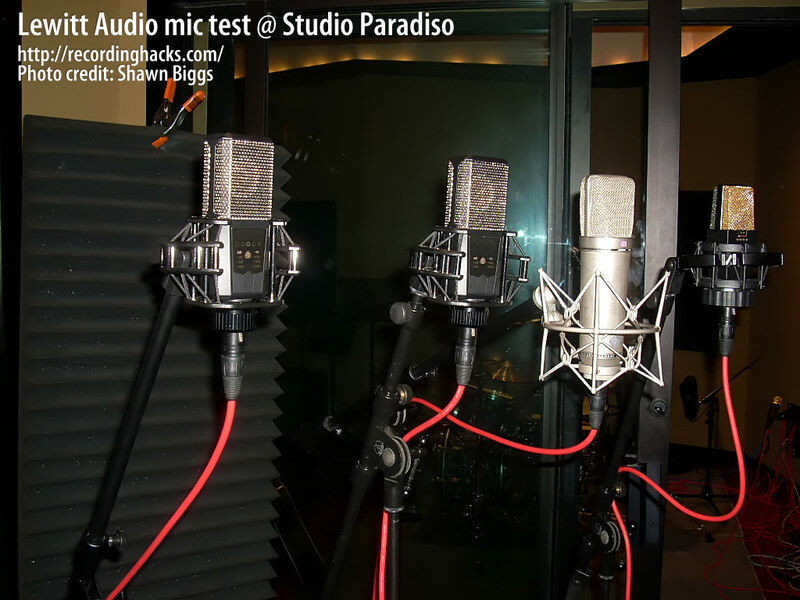 Both mics are large diaphragm condensers with 3-position pads and high pass filters. The LCT540 is cardioid only, while the LCT640 is switchable between 5 polar patterns. They come in a flat black mini road case with a black shock mount, a black bag and a black foam windscreen. Black, black and more black, I love it. 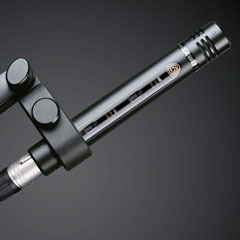 I especially liked the shock mount, which is an open-faced half circle design which makes mic positioning easy. You could press it right up against the grill cloth if you wanted to. The mics and accessories looked great, felt sturdy and seemed to be very well built. The mics have electronic pushbutton switches for pad, HPF and polar pattern selection. Both also have some sort of automatic attenuation, key-lock, and “clipping history” features that seem interesting but weren’t explored for this review. 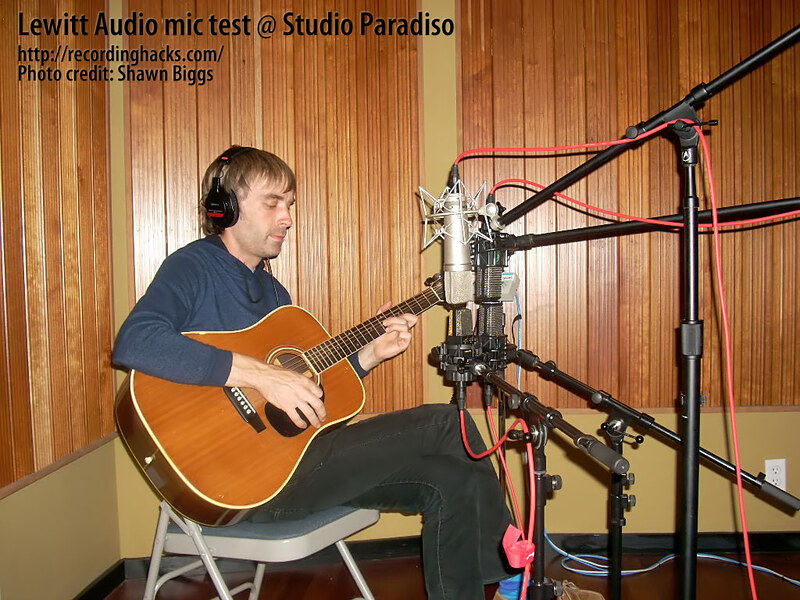 For a first listen, my friend Andrew Berg stopped by Studio Paradiso to play some acoustic guitar and sing a little song. Andrew is a talented multi-instrumentalist who currently rocks out in Hollow Mirrors. 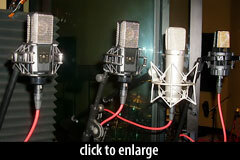 We lined up a vocal shootout with the two Lewitt mics, a vintage Neumann U87 and an AKG C414 B-TL II. 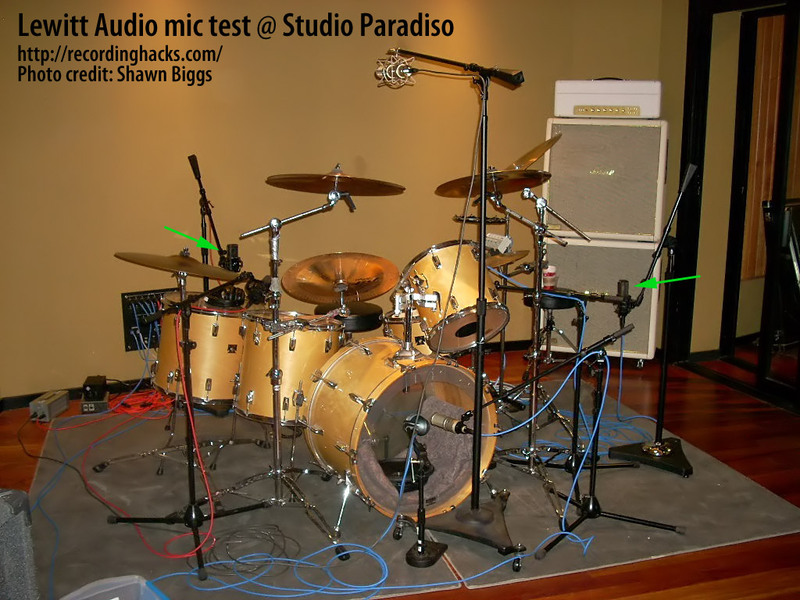 All four mics were buck naked, no pads or filters, to try to get a good sense of the tone and sensitivities of each mic. The signal path was Manley Dual Mono Mic Pres into Pro Tools HD via a 192 I/O at 44.1 kHz/24-bit. Andrew sang a passage straight into each mic from a distance of 8–10 inches. Here are gain-matched 320kbps MP3s from the vocal mic shootout. Click the button below to reveal which audio came from which mic. The first thing to hit me was the low end of these mics. They are very full-sounding mics. I liked that fullness in a solo audition but wondered how it would sit in a track. We moved on to test the U87 and 414 to put things in perspective. This particular U87 gets used a lot in my studio. It almost always makes me happy and is my favorite mic to use when I need presence. Indeed, the U87 had a leaner sound and a little more bite. It was interesting comparing the top end of the three mics. The Lewitt mics sounded nicer in the top, but I liked the U87 better. I know that some of this is just my familiarity with this U87 and knowing how easy it is to get that sound to sit right in the mix. I was holding onto that U87 presence but was impressed by how expensive/expansive sounding the high end was on the LCT 640 and LCT 540. There was a great sense of the air around the source which translated into a nice size. The U87 had that as well, but it was definitely smoother on the 640/540. The difference in the low end was pretty dramatic. In comparison to the Lewitt mics, my U87 sounded thin. I shouldn’t say “thin;” maybe “leaner” is a better word. This didn’t bother me, as I could see the benefit of both. I would be reaching for the U87 when I need something to cut through the mix, and the 640/540 when I wanted things to sound a little smoother and fuller. In my mind the Lewitt mics seemed to draw some inspiration from the venerable 414 so I was curious to see how they would compare. But the 414 was fairly disappointing to hear after the Lewitts and the U87. It just sounded small, dull and boring in comparison. Listening to the 414, it became apparent how nice the off-axis response of the Lewitt mics was. I usually record vocals in a mid-sized room that is a bit more lively than a typical vocal booth. The off-axis response of the 414 seemed to pull out all the trash in the room. I like to have a little room sound in there, and the Lewitts made the room sound smooth and natural. For the acoustic guitar, I set up all four mics together about 18 inches in front of the guitar and recorded them simultaneously. Overall, the results were the same as with vocals. The 540 and U87 sounded the best to me and the decision of which to use would probably come down to song style and how the track needed to fit in. This may not have been the best way to test these mics, but it reaffirmed my earlier thoughts. The 640/540 sounded great but were in danger of becoming bulky and had me itching for a little EQ. They did make the room sound nice and it may have been better to position them a bit further back from the guitar. Again, the U87 had the presence while the 414 was boring in comparison. Here are gain-matched 320kbps MP3s. Click the button below to reveal which audio came from which mic. Enough of the semi-science, it was time to rock the folk out. Andrew positioned himself in a classic singer/songwriter pose. I put the LCT 540 up for vocals with the included foam screen on to stop the pops. I positioned the mic just slightly above his mouth, 8–10 inches away and angled slightly down. Then I took the LCT 640, put it into Wide Cardioid and placed it just a little up the fretboard from the sound hole. I used the same signal path as before, Manley mic pres straight into Pro Tools. I added some Lexicon 300L at Andrew’s request and we ran down a couple takes. When it was done the things that I had previously thought about the mics were reaffirmed. Mainly, these mics sound great. They are very flattering to both the source and the room. The sound is full, but I thought a little much with both mics combined. Andrew was playing without a pick which may have added to this. In retrospect I could have made use of the HPF on the mics. I pulled up a couple MDW EQs [Massenburg DesignWorks Hi-Res Parametric EQ] in Pro Tools and took small scoops out of both around 200hz. That was the only processing used. There was no de-essing, no compression, etc. I came up with a blend I liked, the 540 on vocals, the 640 on guitar 4–6db lower and a decent amount of Rich Plate. I took that and bounced it out of PT. I was really happy with the results and would be excited to use these mics on every session. Engineered and mixed by Shawn Biggs. 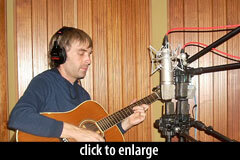 Recorded at Studio Paradiso with Lewitt Audio microphones. I was impressed by these mics. They have a great sound that is big, full and natural. The track sounds like a nice version of what was happening in the room, which is pretty much what I am going for most of the time. While recording an album with the aforementioned Hollow Mirrors, I used the two Lewitt mics as overheads. Well, not really overheads, but as sides in a twisted Glyn Johns setup. They were part of a pyramid, each mic placed 40'' from the snare drum, one mic directly above the kick pedal and the two Lewitt mics off to either side about 4'' in height above the snare and floor tom. This is not my usual setup — I normally do a straight Glyn Johns for most of my drum recording — but the this was a wide kit and I was trying to balance the image. The Lewitt mics worked great in this setup. Signal path was Manley Dual Mono Pre into Focusrite Red EQ into an Alan Smart C1. EQ and compression were minimal. The first sample is just the Lewitt mics which were my overheads/sides. The second sample is a rough mix of the whole kit which included a Peluso P12 as a mono overhead, a Shure Beta52 on kick, Heil PR20 on snare and a Beyer M201 on snare bottom. Again I felt that I got a nice smooth sound with a solid low end and midrange. The cymbals sat nice, not too harsh and with a nice decay. I would be happy to use these as overheads anytime. The following weekend I used the LCT’s on vocals, percussion, drums and piano. I didn’t hear anything that I thought sounded bad. They have a rich sound; it’s big, full and smooth. My only issue was that the sound got a little too thick for me at times. I need to stress how minimal a complaint this is — it isn’t really a fault, just a characteristic. My preamp choice was probably accenting this as the Manleys are very rich sounding preamps. Using a Chandler TG2, LTD-1 or A-Designs Pacifica lessened this effect, but it was still a part of the sound. I wouldn’t say that either mic was boomy, just thick. This character also worked to my advantage on some sources as it added some welcome weight to a few anemic sounds. I didn’t get a chance to, but I look forward to hearing these mics on bass cabinet and kick drum. Here is a sample of our grand piano using the LCT640 and 540 as a spaced pair just inside the lid. Signal path was Manley Dual Mono pre, Summit EQP200B and Smart C1. It came time for guitar overdubs on the Hollow Mirrors session and I had a feeling that the LCT640 was exactly what I had been missing during basic tracking. The guitar rig was a Sound City 120 head through a Mesa 4×12 and we were trying to get as Gilmour as we could. I was using a Shure KSM313 ribbon mic through a Chandler TG2 as my main mic. I love this setup and the tone was great, but I was missing some chunk. The guitarist was playing a Stratocaster with single coils through a few fuzz and delay pedals. It was a loud, bright sound, but not very thick. The sound I was getting in the control room was a little thin and I was missing some of the intensity of standing in front of the amp. During basic tracking I tried adding a couple different mics, all of which kinda worked, but none of which made me all that happy. So once basic tracking was done I pulled the LCT640 and put it on the guitar cab just slightly off axis and about 8 inches back. This was the sound I had been searching for. And this was the application where I thought, I gotta get one of these mics. The LCT640 filled in what was missing in the sound with that smooth expansive top and solid low midrange. That sturdiness of sound was there as well, the mic easily handled the screaming cabinet and conveyed that loudness without being harsh. Here is a small sample of the guitar playing warming up for a solo. The first bit is just the LCT640, after the first sustain I add the KSM313 in the left channel and after the second sustain I bring in the a U87 I was using as a room mic to complete my guitar sound. The Lewitt was running through a Chandler TG2 straight into Pro Tools. I could see this mic becoming a regular part of my guitar sound. In the end, I like these mics. I tried to add plenty of sound samples to give everyone a sense of their sound. That sound to me is big, smooth and thick. There is a richness to that thick sound that definitely help fill out some sources. Occasionally I felt that the richness set the sound a little too back in the mix for my tastes. My favorite application was electric guitar. These mics could easily be flagship mics for a project studio. In a larger studio they would be used constantly with great results on most everything. 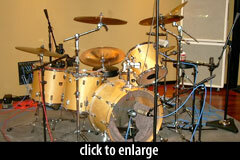 I would love to have one on hand for guitar, kick drum, bass guitar, and voiceover work. I started this review not knowing what these mics were going to cost. I knew the suggested price of the LCT640 was a little over a grand and reviewed it as such. I see now that the LCT640 is available for $800 and the LCT540 for $600. I think both mics present a good value and definitely have an “expensive” sound. They both kept up with my U87 which is a much more expensive mic. There are many options in this style and price range, but I feel the LCT640 and LCT540 are worth considering for their quality sound and ability to sound good on so many things. Loving the sound of the LCT640. I found that I preferred them in the blind tests and was really impressed by the other audio samples too. Great segment! Wow, given the other mikes in the bunch, I was surprised that I preferred the LCT540 for for the vocals, and I ended up picking the 540 and the 640 on acoustic guitar. I’ve been trawling through the database for a new pair of LDC multipatterns for workhorse applications – voice over and stereo pair for location recording at the top of the list. I picked the Lewitts everytime in the blind tests – big thanks for the review and the discovery. Interesting, thank you. On vocals, I clearly preferred the AKG. … but I wonder if it couldn’t be a trick from the volume. The AKG track sounds louder than the three others. 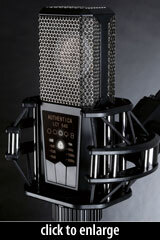 I don’t know why people are using the AKG C414B like a reference. This microphone sounds full of crap for me on any sources. I really don’t understand why this awful microphone is everywhere. People are buying stuff just because they are cheap and everywhere and don’t even heard the difference. This mic is the worst reference ever, overrated product. Every great producers know it. 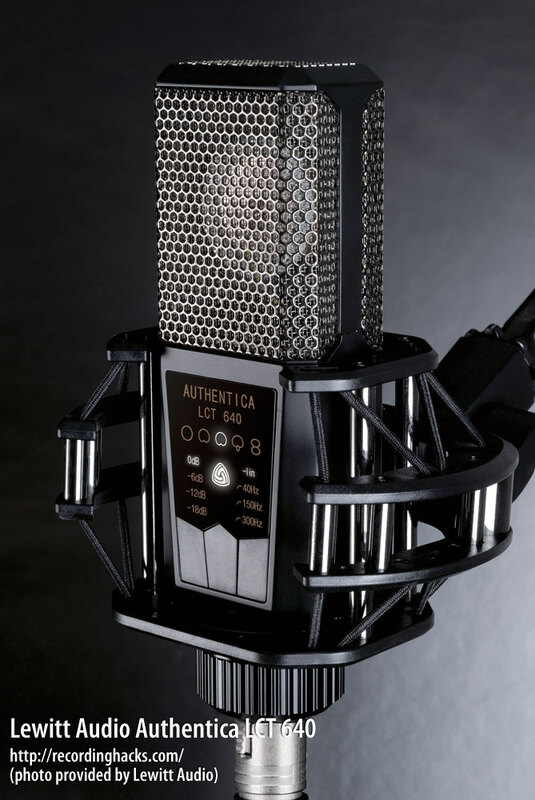 I’m really impressed by these mics, and i just ordered a 640. But I’m most impressed by the song “Good times” by Andrew Berg. Beautiful song! The guitar sounds a little bit “Dull” for my taste, ut the voice sound and the voice itself are just amazing! Keep going on recording hack! Perfect site. My blind test results : I picked the LCT 540 for the vocals and LCT 640 for the guitars. They sound so clear, rich and detailed. On the other side, I always felt AKG being the worst on all 3 blind tests. It sounded too boomy and the self-noise was horrible. Been working with both 414 & 87 over 20 years and picked two best sounding from the samples..ALL were Lewitt’s. Damn, good mikes.